In my professional career I have had to attend many leadership seminars which almost always had team-building activities. That typically involved the introduction of attendees to various games. Frankly, I was often a reluctant participant. I went into the game with the idea that if they wanted to pay me to waste time like this, then who was I to object? Still, that didn’t reflect a very good attitude. I can now see the benefits of those games in breaking down barriers of communication and risk taking. Once you have ‘broken the ice’ and bonded with a team member, it becomes a lot easier to cooperate and achieve goals. My point is, games were a big part of growing up. 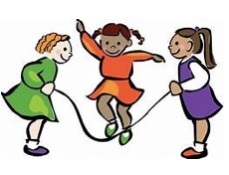 Back in the day it was common at recess for teachers to organize one game or another. It happened at church vacation bible schools and at various other camps, all with the same result. We had fun, we bonded, and we helped each other bring victory to our team. Wow! Maybe childhood play is much more important that we knew. Games were played by children in neighborhoods across the world. Playing these well-worn and semi-organized games was part of our lives when growing up in our community. As such, they became part of our language and our universal understanding of certain principals. Through these casual games we learned to cooperate with each other. We learned to be leaders and how to follow directions. We learned to obey rules, to work together and enjoy friendly competition. We learned how to win, and how to lose, and how to deal with both. In thinking of games after a short time, it was as if they were still happening. I rediscovered renewed acquaintances with old friends. Surprisingly, my mind was jumping with pictures and sounds of yesterday because the bonding was not for just back when, but for a lifetime. In silent repose, sounds of yesteryear wafted through my memory. I could hear “Ring around the Rosie, Pockets full of posies; Ashes, Ashes we all fall down!” I never understood this one because it normally rang out from neighborhood girls down the street while I played with toy trucks in the dirt. I heard it enough to remember it, so regardless it was part of growing up. Later, I would hear my wife playing the same game with my young sons. I would put down the paper and watch in their delight when it was time for them to fall. Because she grew up somewhere far from my home town, this proved the universality of many of our games. Everywhere I went I saw series of squares drawn with chalk on sidewalks. Another chant rose in my mind, “One, two, buckle my shoe, three, four, shut the door, five six, pick up sticks, seven eight, lay them straight, nine ten, big fat hen.” If repetition builds memories it’s no wonder I know these words. They were everywhere, echoing in the background while I employed myself with other things. 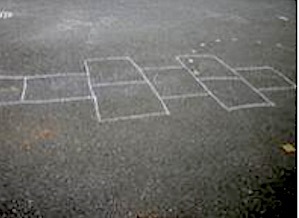 It was the girls that usually played hopscotch. Once, some girls tried to introduce the game to me. I tried once or twice, but it required jumping and not hitting lines, standing on one foot, and bending down to pick up a rock. It was too hard for this clumsy boy. When the girls saw how bad I was, I was sent away. I heard them whispering to each other as I left. “Poor guy. He can’t even stand on one foot!” I heard, but understood because they were right. I decided to try and excel in something else. At school or church gatherings we played ‘Tug of War.’ It is still being played wherever people gather. I remember it being played where the rope stretched over a pit of water, or a mud puddle. Losers had to wear their wet badge of defeat until they had an opportunity to change. Blind Man’s Bluff was another game where ‘it’ was blindfolded and placed in the center of a group. The blind man would have to find someone, touch them (or hold them). To make this a challenge the free kids had to get as close to ‘it’ as possible without getting caught. If ‘it’ did catch someone and could guess who they caught, then that person became it. This one reminds me of ‘Marco Polo’ played all around the pools of America, except it is much wetter. 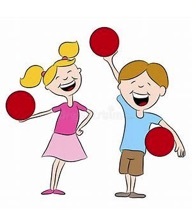 In grade school we played dodgeball, but since I was relatively slow, I was often ‘it.’ Teachers sometimes rescued me and started the game over so I could have a break. I didn’t mind because I thought it was more interesting to be ‘it,’ so it didn’t matter. I remember playing ‘Drop the Hanky’ in grade school. Again, this game required a circle of kids. One would carry a handkerchief around the outside of the circle and would drop it behind someone. That person had to pick up the hanky and run in the opposite direction around the circle to reclaim the vacant spot before the original person would claim it. If they didn’t it was their turn to drop the hanky. I wasn’t fast so if it dropped behind me, I’d be ‘it’ for a good while. Musical chairs were a little better for me because it didn’t require running. I got good at claiming a seat, but in the end, we all had a lot of laughs. It was fun when two bottoms aimed for the same seat. Usually it meant someone would end up on the other’s lap, or on the ground. That was very like the ‘cake walks’ we sometimes had in grade school. I remember winning a cake once and taking it home. I think I might like to play that game again! A fad that arose during those days was the hula hoop. There were many contests to see who could keep it going around their waist. Even I got pretty good at that. I remember the joke that was born from this craze, “What do you call a hula hoop with a nail driven through it? A navel destroyer!” That was cute first time I heard it. We played ‘pick up sticks’ a good bit. They could be played on the ground, the porch or even a game table. Put in a tall can and shaken they would be dumped on the surface in a pile. I was a challenge to pick up as many sticks as possible without causing another in the pile to move. Sliding one out of the pile was fun, with everyone rooting for the others and screaming when the effort ended in defeat. On the other hand, getting them all was worth celebrating. How about Jacks? I know the girls played that a lot. 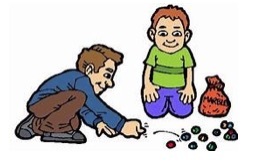 They would dump the jacks on the ground and then bounce the little rubber ball. While it was still airborne they would swipe down and pick up a jack. Different rounds made them pick up one, then two, then three, etc. until they failed. The winner would be the one that survived, if anyone. Jump rope was another thing that the kids did. I didn’t, of course, because I could never jump over the rope even if it were laid on the ground! I never understood how boxers did it. After all, they were men. The kids had sayings that went with jumping rope, too. I bet some of you can remember those. 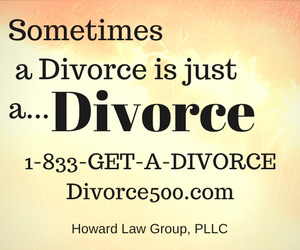 Games were a big part of our past and go toward making up the person we have become. Our games today are on tablets, smart phones, an electronic game boards. I know these are supposed to be part of ‘social media’ but I wonder if the bonding really occurs. Is there laughter and toning of muscles? It is definitely less disturbing and does not require the chalk circles or squares. It doesn’t require running and balance. Can you jump rope on a hand-held? I guess I’m old school, maybe a bit of a fogey, but looking back I see value in these games and a lot of fun for the kids who played them. I’d like to think they will not fade away in the memories of our generation because this kids of today adopting them in playtime. If not, maybe they will experience them at some seminar or a leadership conference.